Also participating in the research were scientists at the University of Hawai’i at Manoa and the Scripps Institution of Oceanography. The scientists conducted a research expedition to the Southern Line Islands, a remote island chain south of Hawai’i. They collected water samples just above coral reefs at midnight and again during the day to compare changes between night and day water chemistry and microbes. “Reef ecosystems change significantly from day to night, but this study reveals one previously invisible aspect: a dramatic and predictable shift not only in what microbes are doing, but which microbe groups are most abundant,” says Craig Nelson of the University of Hawai’i at Manoa, co-lead author of the study. Changes in microbe composition over a day-night cycle show that coral reefs manipulate the chemistry of the surrounding seawater. “This function may modulate the number of microbes in the water, promote cycling of energy through a reef’s food web, or provide stabilizing effects to the ecosystem,” Kelly says. 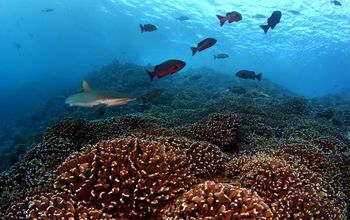 Ongoing work shows that a reef’s health can alter the number and type of microbes in seawater, say the scientists, highlighting the consequences of altering reef habitats. The work was also funded by Hawai’i Sea Grant and the Gordon and Betty Moore Foundation.